"Deer Wise County Decatur, Texas Wise Choice It's Free!" 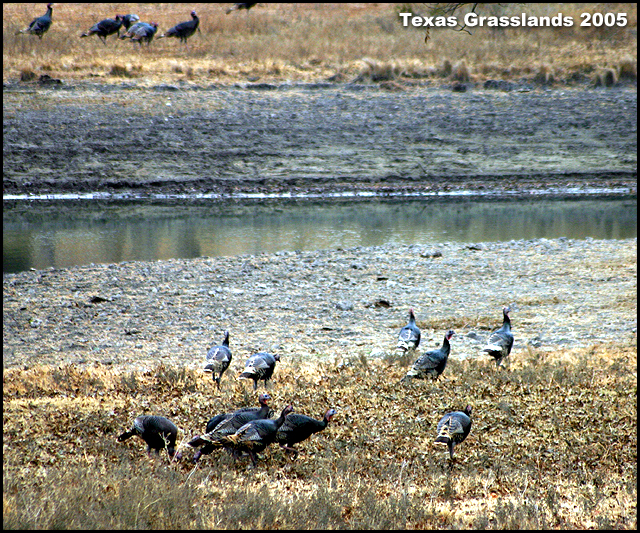 Powder LBJ Grasslands 2006 hunting season. Well I have been hunting the Grasslands for about 10 years and have only shot at 1 other nice buck on it. I have put in to many hours and to many miles on foot to give up my spots. Anyway's I shot a nice buck on my deer lease so started going to the grasslands with my muzzle loader. I went out a couple of times and saw some nice bucks. Water is a factor food is also. When I started to lift my gun he took off around the oaks so I ran down the fence line and saw he was about to cross in front of me so I got down and when he came out I stopped him I shot. After the shot I didn't see him so I thought I missed I reloaded my gun and started walking towards where I shot thinking I missed, when I got closer I saw him laying in a ditch. I could not believe how nice he was, I ranged it and was 110yrds. And as far as me not smiling I was trying to tell my buddy how to use my camera when he took that shot. We were both tired from the drag out it was about 2 miles and my buddy came all the way from Boyde to help me get him out. 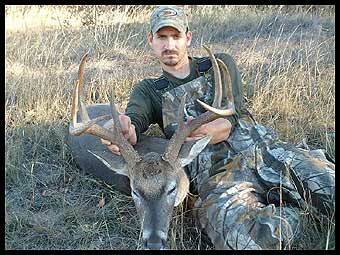 Scott is from Alvord, Texas and has been hunting the Grasslands for over 10 years. 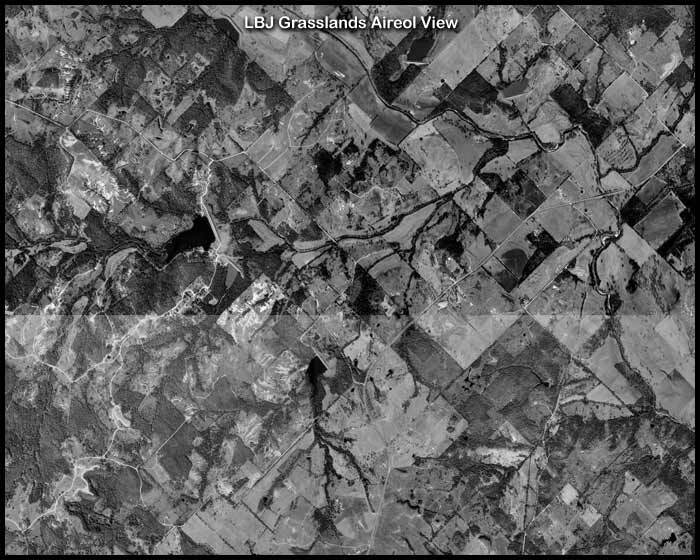 He can can hunt in several LBJ places just 5 minutes from his house. In the ten years he has hunted this is only the second time he took a shot at a wall mount er. 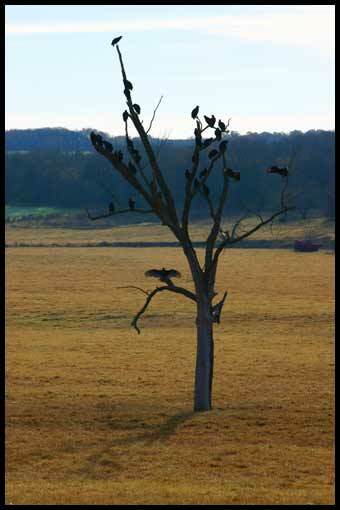 To say the least the Grasslands have plenty of food with acorns and wild vegetation the game animals feast on. 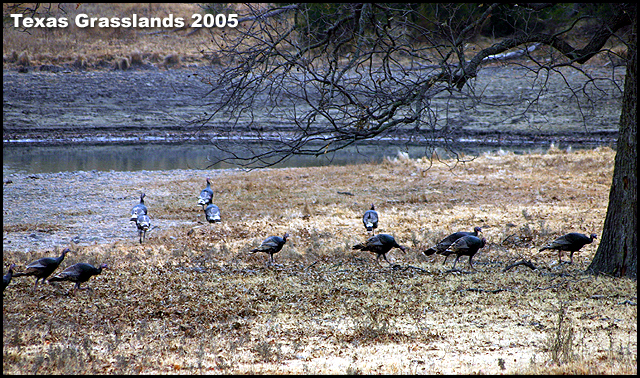 The Deer and Turkey migrate back and forth from private land to public land daily. 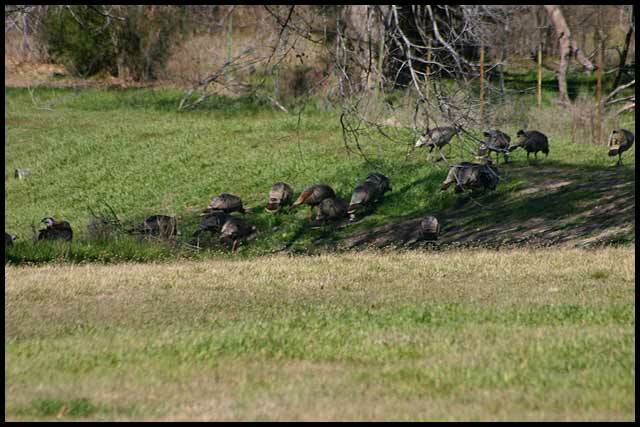 They often pattern hunters when they come and go on public land. 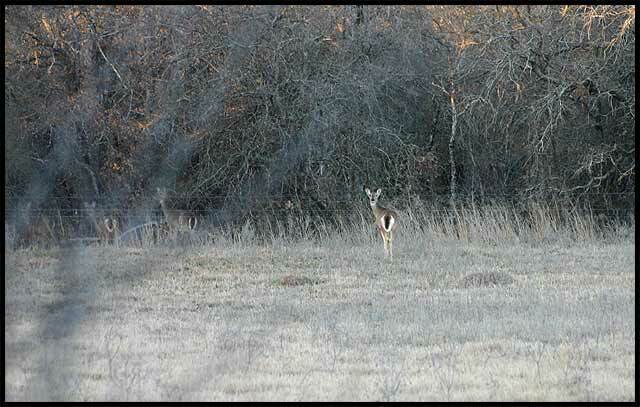 It is not uncommon to see deer come out after the hunters leave for breakfast after 9:30 am during hunting season. 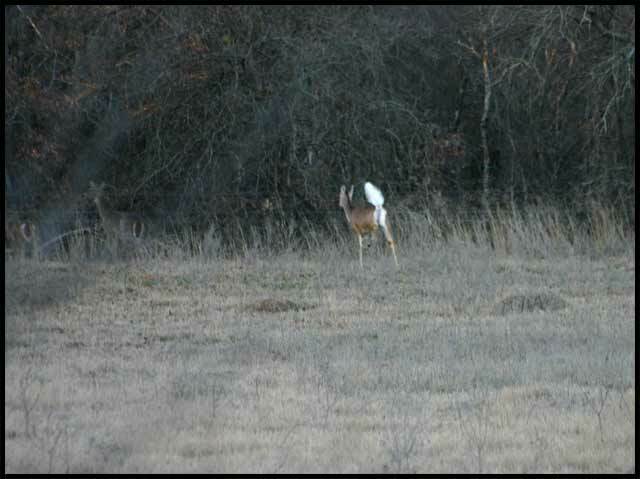 The rut is when Bucks become stupid and are more prone to being harvested. Don't expect a land owners to allow you to come on their land and let you find your deer you just shot either. 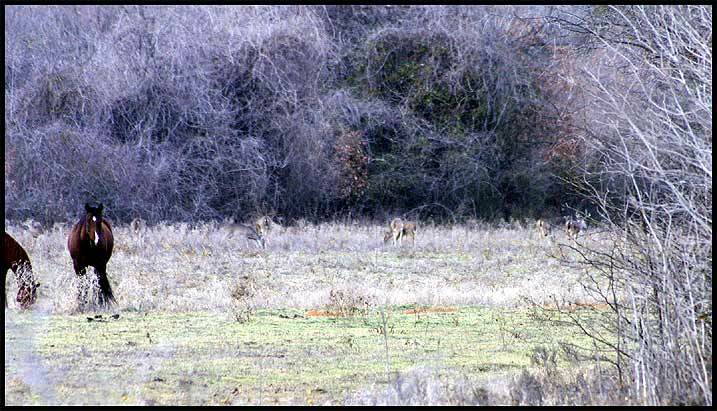 The hunting lanes on the perimeter of the LBJ areas are good shooting lanes. You cannot however shoot over private land it is a class A misdemeanor. You cannot shoot over public land from private land with anything other than black powder or shotgun. The lanes serve several purposes according to district manager Jim Crooks. 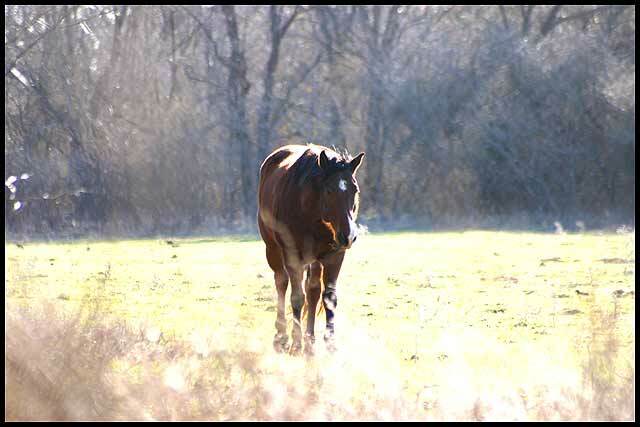 They serve as fire breaks and open areas to replace broken fences on the public hunting land boundaries. Jim says that they burn about 5000 acres a year depending on rain fall and needs for each area. It vitalizes nutrients and gets rid of dead grasses which could create a fire hazard during drought years. These burn areas provide more food within one or two growing seasons. The deer populations are good and getting better. This photo taken 9 does and two bucks private land. 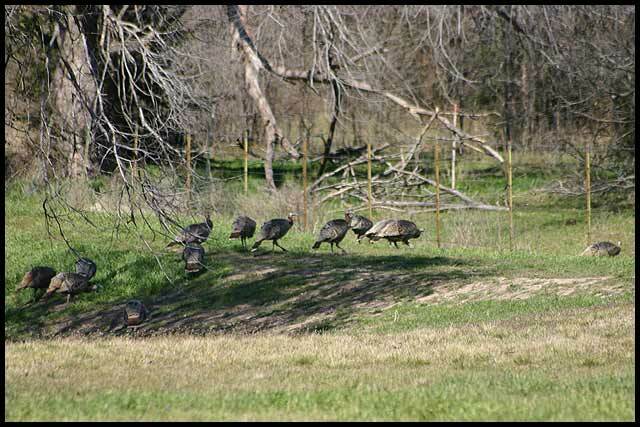 The LBJ Grasslands are home to a large variety of game and special hunting conditions that appeals to more of your real hunter type mentality. The RULES! You cannot bait the game or hunt over it ever. You can only hunt with black powder or shotgun. You can only put up a temporary blind for 72 hours. You cannot drive your car or truck off the roads. You cannot shot over or in private land. Orange vest and hat with gun deer season. Bow season no orange required. 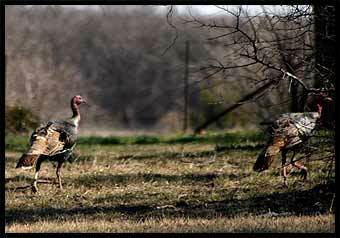 No orange required on spring turkey season. Don't expect any help from anyone who hunts the Grasslands. 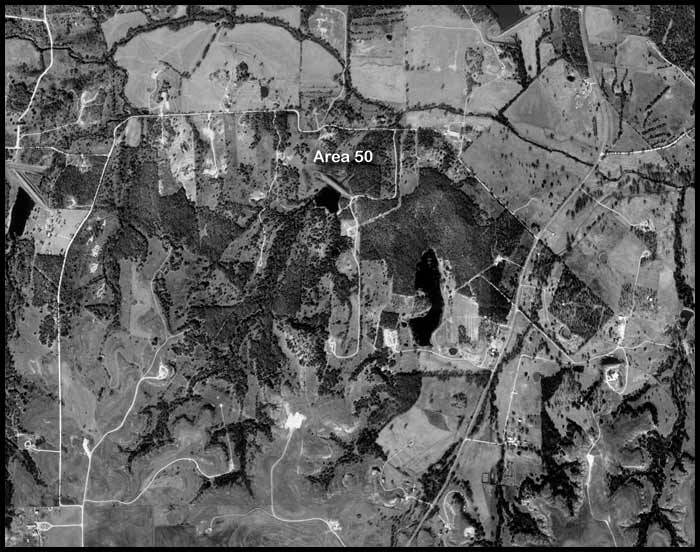 There are 20 thousand acres checker boarding with private land all over the Alvord and Decatur area. The hunters put in long hours for months and sometimes years to find their honey hole spots they usually hunt. The un experienced hunters will hunt close to the roads or entry ways until they become more familiar with the terrain and the hunting areas. 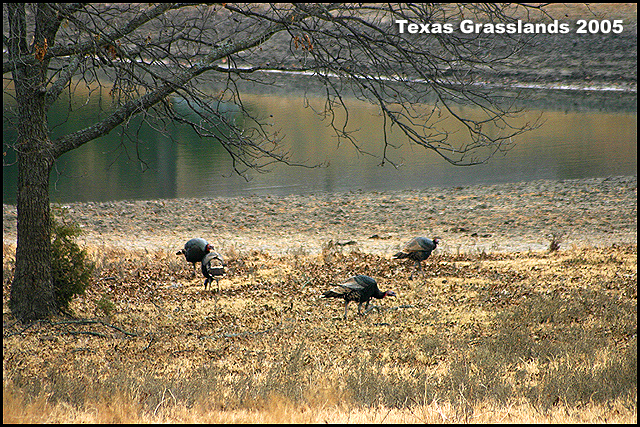 Pressure on the hunting areas drives the game animals to private land adjacent to LBJ areas. 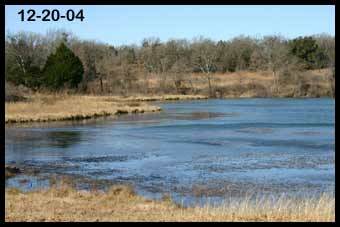 The private land owners a lot of the time do not allow hunting on their land. They treat the game as pets often feeding hundreds of pounds of corn and protein a year. 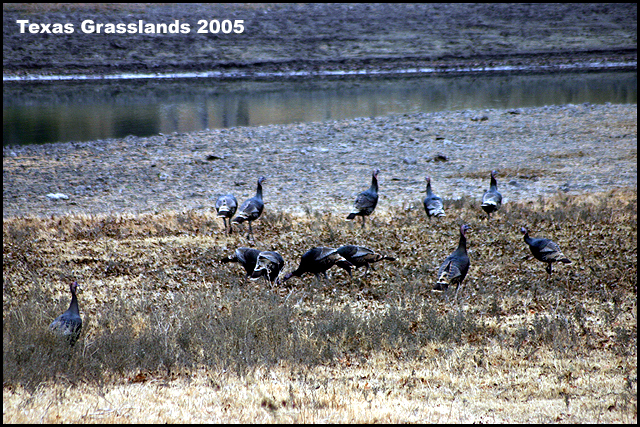 Yard Turkey private land LBJ Grasslands. 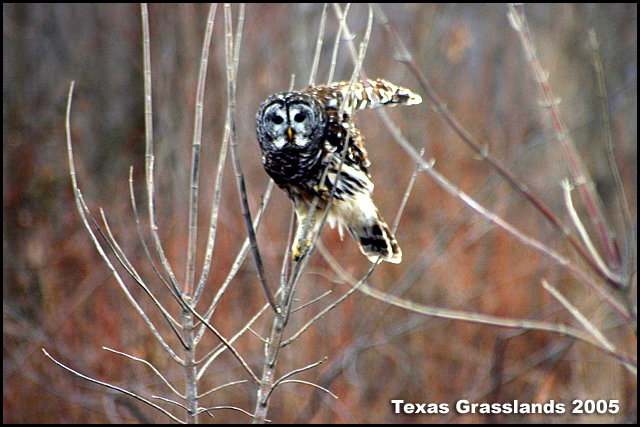 The Grasslands were created in the 30's when Franklin Roosevelt set a side land for conservation of habitat for game and land restoration. 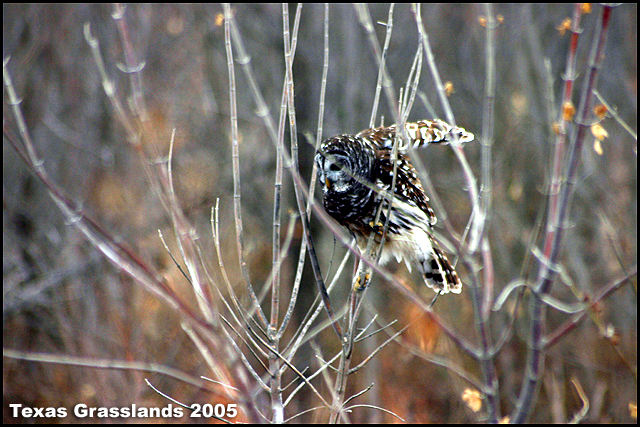 The first WW came and halted funding for the purchasing of large tracks of land to be set aside for conservation. 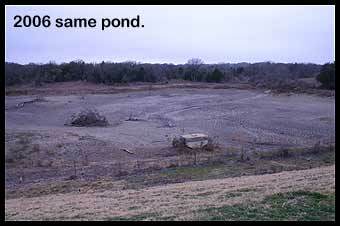 That is how the private land and hunting land became so checker boarded. Even today there are still some trading of land plots with private owners in the area. Al Sanchez Questions: Game ratio bucks to does are? Numbers increase or decreasing? Turkey numbers up or down since 1996? When they do burns when is that area food productive again? 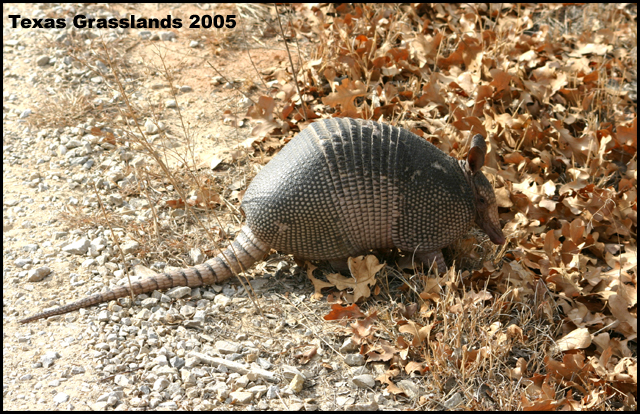 How do you estimate your game animals? How often do you survey?